When: Now Through December 1st. 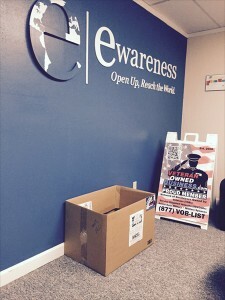 Between now and December 1st, 2014 you can donate new, unwrapped toys or gift cards for our military kids by dropping them off at eWareness’ main office located in Downtown Melbourne, Florida. Help spread some Christmas Cheer to our Military Families this year! Donate unwrapped toys for kids of ALL AGES (babies to teenagers) at eWareness (dba Veteran Owned Business) in Historic Downtown Melbourne. Can’t make it in person or shop for a toy, and want to help? You can always make a donation online at AVET Project’s Website, be sure to Note “Toys 4 Military Kids”.